People watch the Olympics and get inspired to try a new sport, or to work out a little harder at things they already do. Some even have a fleeting memory of past glory and say, yeah, if only I hadn’t quit my sport early, if only I had worked harder, I could have done that. Not a lot of people say: I’m going for it. Even fewer shave 36 minutes off their marathon PR in five years and actually qualify to run with the most elite marathon field in their country at the Olympic Trials. Teal Burrell did. 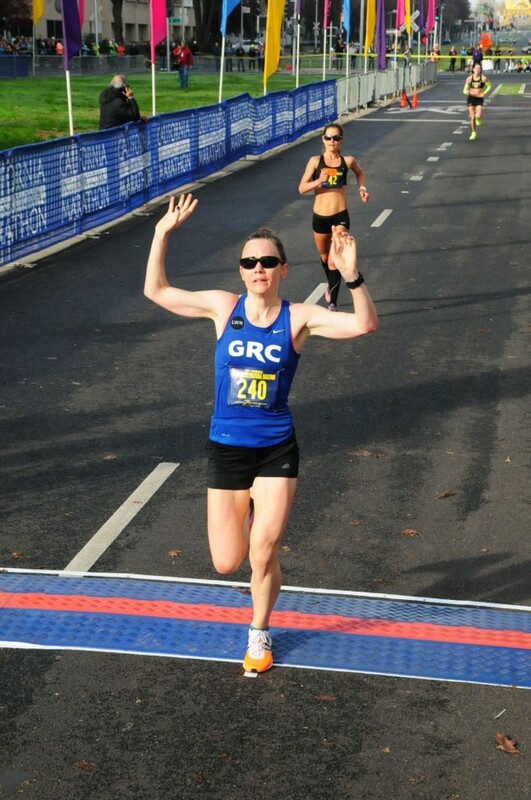 On Dec. 7, 2014, at the California International Marathon in Sacramento, she finished in 2:42:13, a 10-minute PR and a qualifying time for the trials by a handy cushion of 47 seconds. Going by her recent times, Teal (named for the duck, not the color: her parents were hippies, her father an ornithologist) would appear to be among the elite. These are the runners, it seems, of superhuman sinew, who are finishing while people in the last corral are still waiting for a porta-pottie. [button-red url=”http://www.milestothetrials.com/” target=”_self” position=”left”] Teal’s blog[/button-red]Teal is an elite runner, but she started out as one of those mere mortals, a member of the middle of the pack, chugging along the streets of Charlottesville in a cotton t-shirt, finishing her first marathon in 2005 in 4:07. She was still a college student, and that “beer and burritofueled” marathon was going to be her last. Until it wasn’t. A few years later, she started back up, with an idea that she would qualify for Boston (3:40 at the time). She thought lowering her time that much would take a while, and kept preparing family and friends, and herself, for setbacks. On her first try, though, she qualified for Boston by 11 minutes. From there, the goals she set for herself became progressively more challenging, but she continued to doggedly chip away at them in sometimes agonizingly slow increments. Though she ran in high school, Teal claims that she didn’t have any real competitive drive then; even today, her only real sense of competition is with herself. What keeps Teal fighting is the part of her that says she can’t, a voice she constantly strives to silence. Teal has been climbing the ladder towards the Olympic Trials since her first Boston Marathon in 2009. Living and training in Boston at the time, that’s when she became obsessed with the running lifestyle, when running really absorbed her. She first set her sights on breaking three hours, a feat she accomplished in 2011 partly due to the pacing efforts of her brother, Blake Connor, whom she enjoys an encouraging rivalry with (Blake is the reigning 10-mile family champion, a title that she mentions came in a post-marathon race that only he was really training for). Teal’s secret to the next great achievement is setting small goals between the big ones. She knew she wasn’t going to get to the trials from one race to the next, or in one season, that it was going to be important to keep moving forward, keep challenging herself, and keep bouncing back. It hasn’t been all smooth sailing. Teal has had plenty of races where her performance didn’t meet her goals, where her times didn’t match up to all the hard work she had put into her training. Her teammates say that she channels that disappointment into working that much harder for the next time. She likens it to her years in the lab as a scientist. You try experiments over and over and it’s incredibly frustrating and they don’t go as planned, but you just keep trying. Running, to her, can be similar – you keep expecting something to work and many days it just doesn’t. In 2013, Teal suffered a hip injury, the first time she had really been hurt. She came back cautiously, after using physical therapy to learn that some of her stretching techniques needed some tweaking. She also added yoga and foam rolling to her routine after her comeback. In June of 2012, Teal joined the Georgetown Running Club. She said the improvement she’s seen from track workouts, the accountability, the support and caliber of her teammates and the positive encouragement of coach Jerry Alexander have been the high points of running with a group. The biggest thing, she said, is “having another voice, when you have a bad day or a bad race, another person there that knows what he’s talking about” and can override the internal voice that tells her she’s not good enough. Alexander has seen Teal’s improvement since joining the team most dramatically in track workouts. Not having run competitively in college, Teal was uncomfortable, nervous, and lacked confidence. But she knew that she needed to do the work on the track to reach her goal, so she kept at it. He thinks that the team atmosphere helped Teal work towards her goal because it gives her an added incentive to show up and suit up after setbacks. He thinks the other women on the squad helped reinforce one of the toughest truths of running, which is that sometimes you put in all the work, have a perfect day, a great plan, and it’s just not your day. He noted, as an example, Teal’s performance in Boston in 2014, when she was primed to break 2:50 with a great training cycle and finished in 2:58. After that, the message Teal heard from her coach and the other women on the team was that a bad race doesn’t make you a bad runner. She would be ready when her day did come, and come it did. Alexander framed her Sacramento performance as an upset victory of willfulness over hesitation. While Teal has certainly benefited from the energy and camaraderie of the other women on the team, they draw equal if not greater inspiration from her. Teammate Kerry Allen goes to Teal for advice on marathon training, and plans to emulate her incremental mileage increase and the long run strategy Teal used that had her working up to 16 miles at marathon pace effort. Kerry joined GRC shortly after Teal, and has found inspiration watching a teammate achieve a goal she, too, has set for herself. “She’s a testament to the importance of believing in yourself,” Allen said. Teammate Julie Tarallo was at the California International Marathon with Teal and crossed the finish line shortly after her achievement. In the same conversation she also talked about Teal’s patience. That’s the difference between people who only dream big and those who achieve big dreams. Logging the thousands of small steps in between, and being ready to go all out when the dream is within reach. If you’re stuck in the mid-winter motivation lull, or have given up for the umpteenth time on your stupid, too-big-to-dare-dream-of goal, then Teal’s blog, MilestotheTrials.com is required reading. If you find yourself dialing back your goals for the race season, or diminishing what you think you’re capable of in the long term, know that, in five years, Teal Burrell set and achieved the goal to do what only around 200 women in the United States in each Olympic cycle will achieve.